"We are actively working to ensure the safety of the crew members and have sent first responders to secure the scene and work closely with local authorities at the crash site," said Col. Kevin Kennedy, the bomb wing's commander. The B-1B has flown in both the Iraq and Afghanistan wars. How do you know? Were you on the plane? it said there were injuries... so they aren't necessarily ok. And they didn't get out – the B-1 has a capsule that ejects... in essence all 4 on board were like being in a car the blew away and then parachuted. They never felt the wind, no windshields blowing away, etc. That is COMPLETELY wrong. You are thinking of the F-111. The B-1 has 4 individual ejection seats...ACES II. The B-1A had the crew capsule, like the 111s. The B-1Bs are individual ejection seats. The one's out of Ellsworth are B-1Bs. Wrong answer. the capsules were only used on the A model. The B-1B uses 4 individual ejections seats. If the A/C was flying low level (as low as 200 ft AGL at 600 knots) the ejection would have been very hard on the crew members and most of the injuries sustained are the result of that ejection. Jimmy Carter canceled the B1 back in the late 1970's because it clearly was incapable of performing the intended mission, penetrating Soviet air defenses, and the then secret Stealth bomber had a much better chance of being successful at that. Reagan revived the B-1 and wasted tons of dollars on it. Notice that almost all of the heavy lifting in both Gulf wars was done by the ancient B-52's . Note also that every penny we wasted on the B-1 reduced the number of B-2's we could afford. I'm not even going to mention the waste on the mythical Star Wars defense, or the ICBM's on a train. Still think Reagan did such a great job? Yes. Reagan did wonders for the military, of which the democrats did (and continue to do) – fleece it of money. Sure, the B-1 was not a good investment, never ended up having a purpose, etc, but it did fill a niche equipment wise. It's like right now... money, and oh yeh, democrats, killed the F-22 production, the F-35 is being time delayed (any advanced high tech aircraft will be)... and there is nothing in between to keep us flying, as the F-16/15's are being worn out from the everlasting war no one saw coming. Then add the economy and now the sequestration – brought about by... well, I'll be quiet. Yes, we once had a lot of jets. Now we have few, with fewer yet coming. Our nations Air Force is in trouble with old aircraft and still awaiting new ones. I am surprised China let alone N. Korea hasn't jumped at the opportunity to start something. I agree with you about the waste and would extend the effects to lost infrastructure,education and health care.Ronald Reagan was a disaster for the U.S. It does not matter how many times the great GOP machine talks about his greatness,he was not good for the average american. As history has now taught us, The B1s were a monitary coverup for the construction of the f-111s. One thing we are forgetting here: in the early 1960's there was the B-58 Hustler. One of the fastest, supersonic bombers made. It scared the stuffing out of the Russians at the time and forced the retirement of the aircraft. 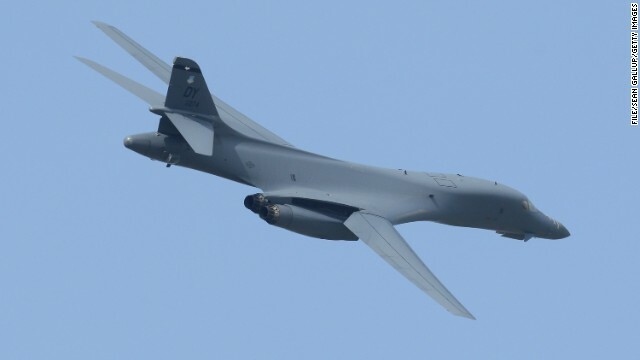 Then later when we needed another cold war feather along comes the B-1. A very capable aircraft. Now, what do we have to replace the B-1? The B-52? The Stealth Bomber? NOTHING! So we lost one. At least the crew is safe and we can move on. Long live the B-58! Hustler and Valkyrie did not scare Russians at all: they just prompted development of Mig-25 interceptor. This wasn't another rogue colonel buzzing the tower while turning in a 90-degree bank, was it? Historically, the B-1B has made a great plow but a poor bomber. One of the biggest hanger queens ever flown. If by hanger queen, you mean THE bomber airborne 24/7 for most of the Global War on Terrorism, then yes. Know the facts before you show your ignorance. Might want to check your history again. USAF refused to take B-1's to panama or Libya, or Genada, and they were not in the first waves during the Gulf War nor in the Serbian/Bosnian conflict, nor in the Iraqi invasions nor the Afghanistan efforts. Once all threats are removed, THEN the B-1 can go in. But it is not an effective weapons platform, compared to other aircraft, drones, or missiles. Dan...the only thing you had right was the B-1 didn't participate in the first Gulf War – it was a nuclear bomber then. Recheck your facts about EVERYTHING else. Dan, your all wrong and have no idea what your talking about the B1 was one of the first bombers in Afghanistan. Its a first Responder for across the world due to its speed and range. During the 2003 invasion of Iraq, the B-1B got to show its capabilities. While flying only five percent of the sorties, the B-1B delivered 40 percent of the bombs. The 216 ton aircraft can carry 34 tons of bombs in its three bomb bays. Because the B-1Bs are twenty years younger than the B-52s, they were available for duty as much as the B-52s and became particularly popular over Afghanistan, where its higher speed (compared to the B-52) enabled one B-1B to cover the entire country. On a slow day, the single B-1B could hustle from one part of the country to deliver a smart bomb or two, and then be off to another tense situation on the ground. This is the first sustained use of the B-1B and, by and large, the bomber has performed quite well. yep. Now to get all the politicians to agree, esp the ones in the states that has them stationed there. I worked on it for eight years and it was the experience of a lifetime. The B1-B can operate out of very short airfields so it has a large tactical benefit over the B-52. The B-2s are insanely expensive to operate, and there are not very many of them. Best wishes for the crew. My first question: how many nukes are rolling around out there? The entire Pentagon report on that, injuries, etc. is vey sketchy, as usual. The days of strategic bombers full of nukes flying around ended a long time ago. The days of strategic bombers flying around with nukes on training missions were never. Well...there goes 283 million up in smoke. Sorry to say its a bit more than that. What a beautiful bird ! I live near Amarillo and the B-1Bs seem to practice in my area from time to time. Everytime the world crisis heats up in some areas they show up mainly at night. When people on these blogs are yelling wag the dog I have posted the increased activity. CNN blocks those post every time. Around here we can tell increased tension long before the government releases info. As weeks before the latest terror warning. Its done on the QT but if you know what to look for it is clear. You dropped your tin foil hat. Before we all jump on the "worth $300M" bandwagon, consider that the B-1s are over 25 yrs old. If you crashed your 25 year old car, you probably wouldn't claim the original purchase price as your loss. The B-1 fulfilled its intended purpose long ago–scaring the USSR. Now though, truth be told, the AF has tried repeatedly to retire all of the B-1s because they are hugely expensive to operate, but the wizards in Congress refuse, claiming too many jobs lost in Texas & South Dakota or that the nation would be too weak with only ~100 bombers left. Congressional logic–save money but don't cut anything in my district. We'd be lost without our old AF guys! I would point out also the B-52s production ended before or just about 1960. B-1B were very controversial and it was debated at the time as to their worthiness and their cost. The Stealth bombers were in production secretly and many felt this was a RWR chip play in the cold war. You've still got to cough up the money for a replacement. I seriously doubt that you ever spent a proportional amount on your 25 year old car as that spent to keep 25 year old B-1s or 50+ year old B-52s airworthy and combat ready. How about giving the replacement value of 800 million? We all might be wrong it might have a alien ship that zapped them down! Glad crew is ok! My son flys one of these planes. Until more is known I'll be quite worried. Thanks to those of you with good wishes. I hope any injuries are minor and your son is OK. I hope the Indians find them and drop some early Christmas presents down your chimney. Unbelievable amounts of money. Do you mean to tell me we can afford all this military BS, yet our fellow Americans go without health care, or go to bed hungry? Really? I am 64 years old, never belonged to a political party (I'm apolitical), and I dare say that things are NOT getting better. The 40% of wealth controlled by the top 1% US is actually sustainable, as long as the 99% sit there and twiddle their thumbs. And if you are not Dead, you would need to convert to Talibanism and wear a Turban and need to have a long Beard with no mustache !! So exactly who are we pointing these bombers at? I'm not sure these things have been useful since the cold war. It's not like your going to fight the Taliban or sweep into Mogadishu with them. Although more and more it seems like our only two choices in conflict are house to house clearing or clear everyhouse to the ground at one time. I vote Health Care. You sound like a Frenchman just before WWII. The French were absolutely POURING money into national defense immediately prior to World War 2. On the Maginot Line. That's what spending a bunch of money on the previous generation's technology gets you. Which is exactly what the B1-B is. The B-1 is a very versatile and capable aircraft. It can do things our other aircraft can't- like deliver very large bombs/bomb loads over great distances. Carriers are great but if you've got a long distance target that you need to hit fast, you need a long range bomber and you need the RIGHT bomber for the mission profile. you should have gotten a better job. the 186,000 pounds of metal that just crashed should have been turned into Escalades so the whiners could have a nice car while not looking for a job! That your idea? They should name these things the "condor" as it looks like a graceful flying bird bent on destroying something. The Bone, as it is fondly known in the Air Force, is a fantastic airplane. Capable of supersonic flight at virtually tree-top level, it can deliver a truly awesome bomb load on target. In Iraq and Afghanistan it is sometimes used to simply drop down and buzz enemy positions at Mach 1.15. As someone who was nearly killed in Viet Nam by a supersonic F-4 at treetop level, I can tell you that it's a phenomenally dumb idea to do that. I'm still limping 45 years later but since they torched my records in St Louis in '73, I have no VA care. That's a lie. You have VA care. You mean no veterans disability rating due to a service related injury, if you are being truly honest. It's only a few billion more to the deficit. NO BIG DEAL!!! We owe 17 trillion in debt. Why are they not fighting the 49 forest fires instead of flying around for fun? How exactly would a B1 be used to fight a forest fire? By dropping 12,000, 12 oz water bottles. Think about it..........instead of 1/2 the water dissipating into a fine spray before it hits the flames>>>>>>>>many of the bottles would be like a time release capsule as they melt. That's great, Jeff! It can drop fire retardent at Mach 1 !! The B-1, or white elephant as I call it, is a bomber not a tanker. But if you mean overall, well most of the cargo planes are too busy flying in support of two 10 year wars. And the wings come off the C-130's when they try to fly that sort of profile with a full load of retardant. 60 year old P2V Neptunes do it MUCH better. They are also not particularly useful. We are not going to be fighting any major wars for a very, very long time. Now we have drones and special ops. The only reason we keep these programs going is to siphon off money to Congressional Districts and Defense contractors in order to keep raising piles of money for the Congress critters that vote for the appropriations. The cycle of life. The amusing thing is that the Tea Party folks represent some of the people most screwed by this corruption, but are loudest in supporting it. Please get all of your facts straight before making an uninformed comment like that. A B-1 can do alot more than a drone can anyday! Good thing we didn't have you in charge in 2001. We wouldn't have had any military to defend ourselves. Good job! Defend? We've done nothing but OFFEND since the end of WWII. You touch on some good points, but no major wars? America has heard that rhetoric for generations. The facts are different though. Since the Spanish American war, every soldier who served a full twenty years served during a war. Can you imagine that? For well over one hundred years we have had a major war at least every twenty years or so. Do you honestly think things are getting better? History says we will have another major war in twenty years or so and we should make sure your forces are prepared for it. I love those big ol' beasties. Nothing demolishes an insurgent camp/village quite like a B1's belly letting loose a load of cluster bombs. Shame about the plane, glad the crew made it out ok. I hope it wasn't pilot error. Do you like the smell of napalm in the morning, too, Johnny? And the cluster bombs will still be killing children and farmers 50-200 years later, like in Cambodia or Laos, two countries we never even had a war with but bombed with more ordnance than was used in Europe in WWII. Good thing we are not dropping cluster bombs! 65 bombers left, each one cost over 16k per hour to fly... And were do to retire in a few years, we are ok.. Forget Lee Majors, those 4 guys are now worth $250 million apiece !!! Well, there goes $300 million. More money for defense not on dime for Obama Care. Mechanical things fail from TIME TO TIME. I know that is a big ZIT in your world but get used to it. 283 million 1970 dollars = 1.7 billion 2013 dollars. The B1B bomber was first introduced in 1986, not 1970. Duh. Does that include the nukes. I read nothing of the number lost. Yep, more money in the pockets of Duke Cunningham's buddies, as for the poor, the gop/teatroll healthcare plan is..'just die!" This comment brought to you by yet another delusional American. Maybe we should increase your taxes to make sure Defense gets more money. No, I thought not. So you are in favour of a reduced military right? Oh wait, time for group hug. Did Fox "news" tell you that about Obamacare? Everyone I talk to that knows what it really does thinks it is a good idea, but they can do math, so they aren't Republicans. What EXACTLY does Obamacare have to do with a B1 crash anyway? Trolling much? Dang these planes are costly. Still the crew got out ok. They said the crew ejected. They didn't say they were OK.
costly, and old. Being retired left and right anymore. Technically the crew didn't eject... the capsule did. They don't pop out like in a F15 or 16... an entire capsule with all 4 on board ejects, then chutes open. They never feel the breeze... and land a bit hard. Mark you need to do research. No capsule involed in a B-1B lancer. Each crew member is ejected seperately.